In the interests of education we took a short phtographic expedition around the city of Khobar to try bring back some pictures that really capture the essence of the land. We did this early on a rainy friday morning (The authorities here don't seem to be too hot on people using camera's). As you can see here, allot of pride is taken in the cleanliness of the land. Most of Saudi looks like this. Trash strewn lots with arbitrarily placed buildings. Because the oil industry gave the country such a rapid injection of income the cities didn't grow and evolve like normal cities, so huge buildings get placed in the middle of nowhere. 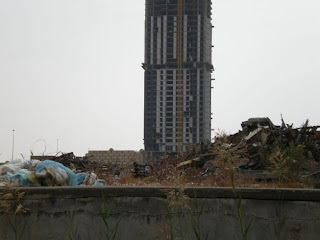 The surrounding area can be a desolate trash heap and and nobody cares. 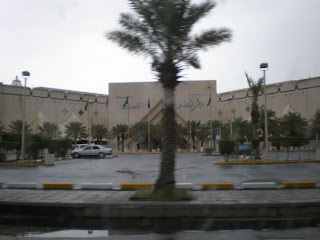 This is Khobar Mall, about 5 km away is the Mall of Dhahran. They're both huge. All malls everywhere in the world are the same (At least thats my theory) and somewhere there a rediculously rich italian that sold the fake marble florrs for all of them. Malls are the only thing here that borders on entertainment, except taht they don't have cinema's (To much like fun) but do have tons of womens clothing shops, and lots of mens clothing shops selling the exact same item of clothing. This is one of the major roads in Khobar. It's name after the King. 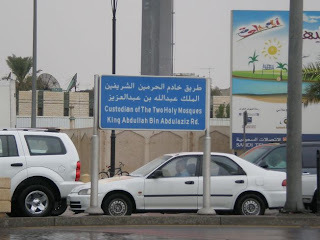 Of course the couldn't just call it King Abdullah Rd (Previously Prince Abdullah Rd), the kings full title must be used when ever he is referenced ("Custodian of The Two Holy Mosques King Abdullah Bin Abdulaziz"), listening to news reports here is also funny, it takes almost the whole report to just say who its about. So when a king dies they have to rename all the streets named after the king and any of the princes whose status subtely changes. pretty much every road here is named after a memeber of the royal family. SO please don't complain about minor road renamnings in South Africa. This is the sign for the "Khobar Model School for Car Driving". I don't think its a very successful educational institute. But if the sign were true it would be a great place, a school where they can teach Saudi's to STOP DRIVING!!! and they say we are crazy to live in Africa! eish my bra...i wonder wat the people in the flats would say if they saw such thingz ek se.